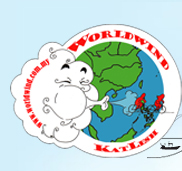 So What is Worldwind 2007? Although originally from opposite sides of the globe, it was destined that 2 people who dreamed of travelling and seeing the world should find each other and make their dreams a reality. From the moment they found out they shared the same birthday they knew that a higher power was working to pull them together! So how did they meet and end up together??? Well, what seemed like an ordinary Friday night out in Kuala Lumpur turned out to be a night where strangers who had met just hours before agreed to fly out and climb Southeast Asia's highest mountain! 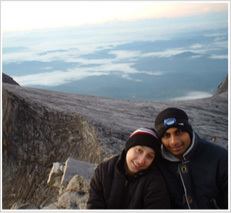 Just days after the drunken agreement was conceived the two of them were watching the spectacular sunrise at the summit of Mount Kinabalu and love was in the air….This crazy expedition set the tone for the whole relationship to come! It wasn't long before a new pilgrimage was hatched, one that of course had to better the last and so Worldwind 2007 was conceived. If there is an easy way and a hard way, you can bet that Ahilesh will take the road less traveled..... Originally Katrina and Ahilesh had planned to travel Asia the traditional way. Backpack at the ready and the tourist trail firmly planned out, they started to discuss the idea that this trip was nothing new, nothing innovative and for a couple who strive to be anything but ordinary they brainstormed ways to make their trip different. Although neither had any previous biking experience (in fact neither had possessed a bike since their childhood BMX days) but cycling around Asia seemed like the perfect twist to the journey. And so it was born.....WORLDWIND2007.....12 countries in 12 months and a chance to see more of Asia than the average tourist. This was the lure of traveling on a bicycle, seeing villages, meeting people, experiencing real life outside the big cities that every traveler sees. Worldwind promises to be the trip of a lifetime for Katlesh. Starting from Cambodia , Katlesh will have a luxurious start to the trip with 3 weeks of the finest hotels as they see the sights of Angkor with Kats family. On the 10 th January 2008 it will onwards and upwards as they start the cycling trip proper. From there it is on to Vietnam to meander along the Mekong River and to tackle the challenging mountains only to enjoy the thrilling downhill rides! Laos is the next stop, the least developed and most enigmatic of the three former French Indochinese states. Thailand is next and exploring the Northern provinces then it is into Myanmar to sample the rich and thrilling culture of a country firmly off the traditional tourist trail. After a quick re-entry into Thailand it is back onto Malaysian soil. Katlesh will travel the East Coast, a part of Malaysia neither has ever been. After a quick pitstop in Singapore they will head back up to KL and the first leg of the trip will be done. Leaving behind South East Asia it is into Southern Asia with the first stop India to explore the many ancient Hindu temples, Buddhist stupas, Mauryan pillars, Mughal forts and colonial architecture. One of the highlights of the trip will be the hop over the Palk Strait into Sri Lanka . Ahilesh's ancestors were migrants to Malaysia from Sri Lanka so this trip will be a chance to discover the land of Ahilesh 's heritage. Hopping back into India it is a journey northwards and into Bangladesh with its archaeological sites dating back over 2000 years whilst checking out the longest beach and the largest littoral mangrove forest in the world. 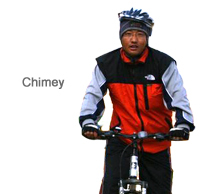 On reentering India it will be a trek North to make Nepal the penultimate stop. At this stage of the trip they will give their bikes a well-deserved rest and continue on foot to Everest Base Camp at 16,901 feet high! The final destination is Bhutan nestling at the heart of the great Himalaya . The mystical Kingdom of Bhutan with its ethos of Gross National Happiness will be a fitting end to a pilgrimage that will give Katlesh a never-ending supply of happy memories. "The symbolism - and the substantive significance - of planting a tree has universal power in every culture and every society on Earth, and it is a way for individual men, women and children to participate in creating solutions for the environmental crisis." Al Gore, Earth in the Balance Aside from fulfilling a life long ambition to travel and see the world, there is more to Worldwind 2007. Apart from the prospect of meeting many people from different walks of life and learning and sharing experiences from these people....Katlesh also want their trip to be in aid of a good cause. Which is why they decided to complete their trip in conjunction with The United Nations Environment Programme (UNEP), which has launched a major worldwide tree planting campaign. Under the Plant for the Planet: Billion Tree Campaign, people, communities, business and industry, civil society organisations and governments are encouraged to enter tree planting pledges online with the objective of planting at least one billion trees worldwide during 2007. Why is this important? Because forests provide not only environmental protection, but also significant income and livelihood options globally for more than one billion forest-dependent people. Trees provide a wide range of products (timber, fruit, medicine, beverages, fodder) and services (carbon sequestration, shade, beautification, erosion control, soil fertility). Without trees human life would be unsustainable. Katlesh aim to travel through Asia educating people about the importance of planting trees and ultimately contributing to the billion tree pledge by planting indigenous trees in every country they visit. We wanted to have a logo for the trip, after brainstorming for a few months Kat did a doodle of what she envisaged should be in the logo, this is what she came up with. A Cloud depicting the winds of the world blowing us out into the wilderness. I then did a doodle using Kats ideas and placed it on a globe with the face of Asia. Now we needed someone to put these ideas into a proper logo...... as you can see we were no Picasso`s!! After months of looking for someone to do the logo, I realized that one of my good friends in Manila was an avid cartoonist. Herve Cotton...... yes cotton. He is one of the most amazing Frenchmen you can meet, married to a Singaporean girl called Susan. They have three kids and a real friendly dog. He sells glass for a living and organizes the best pot luck dinners Manila has seen.